What is The Automata Wars? The Automata Wars is a steampunk/ science fiction trilogy, set in a nearly-familiar world - but not quite. A civilisation at war, hopelessly outmatched by an unknown aggressor. Disease is rife. Monsters are at hand, nearly as monstrous as the war itself. They fight to protect their families, though they do not know why they should need to. Yet within their walls, not everyone is who they seem, and without, not all enemies are hell-bent on their destruction. Volumes 1 & 2 of The Automata Wars are currently available in paperback and kindle format, via The Last Line publishing House. Volume 3 is due out in the near future. Deadly automata infiltrated the city in The Home Front... what horrors await the soldiers on The Front Line? New recruit Private Reynolds never thought that war would be a pleasant experience - but neither did he realise the true extent of the terror he would face in the rain drenched trenches. The monstrous enemy killing machines seem unstoppable; and a deadly, mystery sickness is spreading amongst the beleaguered troops. Meanwhile, there are rumours of dark things lurking in the surrounding swamps, where a second enemy may be waiting to pounce. Even the usually dependable modified Beasts grow less trustworthy. There is confusion in the military. What business do the nurses of the First Aid Nursing Yeomanry have dictating policy? Who is really in charge? 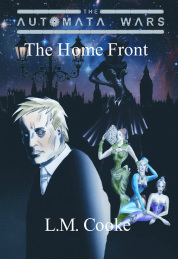 And what are the ladies of ill-repute, under the tutelage of the sinister Madame Jewel, brothel owner and spymistress, doing at the fighting front? For Reynolds, at least, there are some distractions. Amethyst, the beautiful – if strangely composed – nurse who shipped over to the lines at the same time as he, for one. And his commanding officer, the admirable Lieutenant Greyson, a man prepared to stand up for his men against all odds. Digital version includes author after-word, and updated author info. 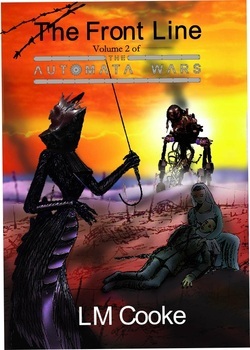 The first volume of the Automata Wars trilogy. invented technology to demonstrate that life can go on as normal. The lower orders turn to either the politicians or the nameless god for hope. On the street corners and in the houses of ill repute, working girls have other methods of keeping up morale. The home front is not as safe as the soldiers imagine. Shadowy creatures hide in the unlikeliest of places. Killers stalk the streets. Enemy agents perpetrate acts of atrocity. From spoilt debutante to working man, no one is immune from the horror.